I wanted to pop in today to share this birthday card I just finished up! Like a lot of us crafters - we have a pretty good selection of that stuff called washi tape! I have plenty to use and don't any more to add to what I have - so I wanted to pick a few random patterns and colors that went well together - as you can see I came up with a teal, black silver combo. I recently bought some glitter washi tape from Freckled Fawn, and wanted to use it on this card! In fact, it was the one roll I grabbed and added on from there. So- I created my washi panel, and then I die cut two frames - one from Mama Elephant's Femme Frames, and the other from Simon Says Stamp Postage Edge Frame Dies. I used "an oldy but goody" stamp set from The Stamps of Life called standup4sentiments. I love this set - simply because its different, and you need sentiments that stamp in this orientation. I stamped and heat embossed it with Hero Arts white embossing powder. I adhered everything together, and placed it on my Coastal Cabana card base. Thanks for taking the time to stop by!! I plan on being back tomorrow with a card tutorial! I am going to try and make card tutorials for you every Sunday! We will see how that works out! Stay tuned!! **I HAVE A WINNER** Pretty Pink Posh Giveaway! Hello, Hello!! I wanted to pop in quickly and announce my **WINNER** for my Pretty Pink Posh pretties!! Between my blog comments, and my Facebook Page comments - I had a total of 30 comments in all! 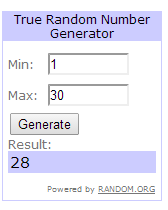 This is my biggest turn out yet for a giveaway!! I thank you *ALL* so much! Barbara Ghigliotty It's so generous of you to offer a giveaway with all these beautiful sequins...thank you! 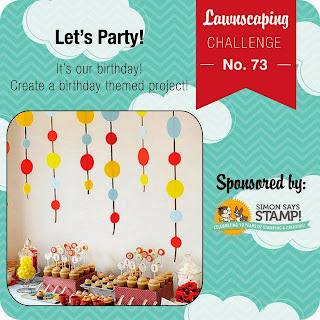 Welcome to a new challenge over at Lawnscaping! For the next two weeks - we are going to be inspired by other designers on the Lawnscaping Design Team. I won't lie - I had a *really* hard time choosing just one designer to use my inspiration from - but I did it. I chose this *CUTE* card by Elena! I liked how you used a "image" as letters :) So - here is what I took away from this inspiration. This is a simple design, but has a fun feel to it. I used one of my favorite alpha sets by Lawn Fawn - Quinn's ABC's. 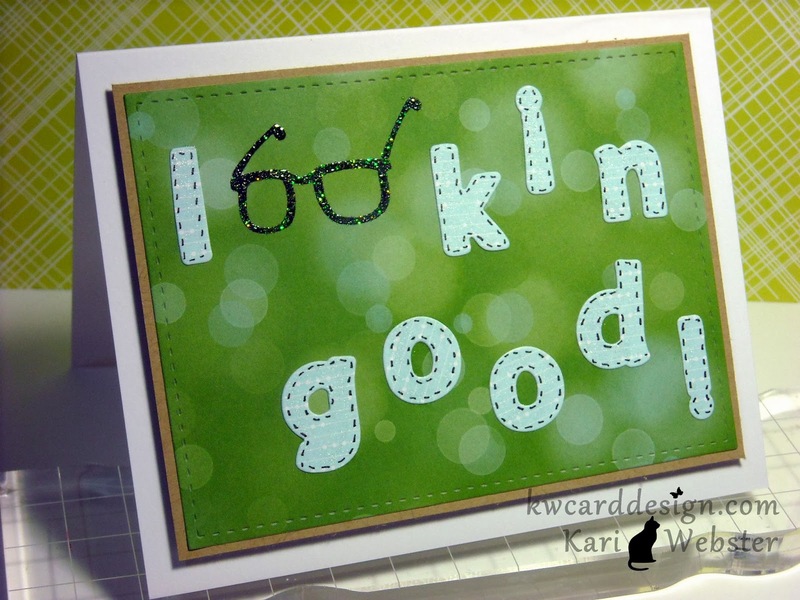 I die cut letters to spell out my sentiment - minus the two "O's" for Lookin' - as you can see I used a pair of glasses from the adorable set "Clear to See" by Lawn Fawn. I stamped my glasses in Espresso Truffle Luxe Ink because I used glitter to emboss over it - and since these inks are a pigment ink - it is a great ink to use for this. Then, I just adhered my letters down onto my "bokah" pattern paper from Lawn Fawn's Peace Love Joy 6x6 pad. The letters are also die cut using papers from the same pad. Then, I adhered the green peace onto a piece of kraft card stock, and then I popped up that whole panel onto my white card base which is Bazzill Marshmallow card stock. To finish it off - I used Wink of Stella to add just a slight shimmer to the rest of the letters. Hello everyone!! Hope your weekend has been relaxing and filled with happy moments. Today I am using some new products that I recently purchased, and I wanted to break them in. 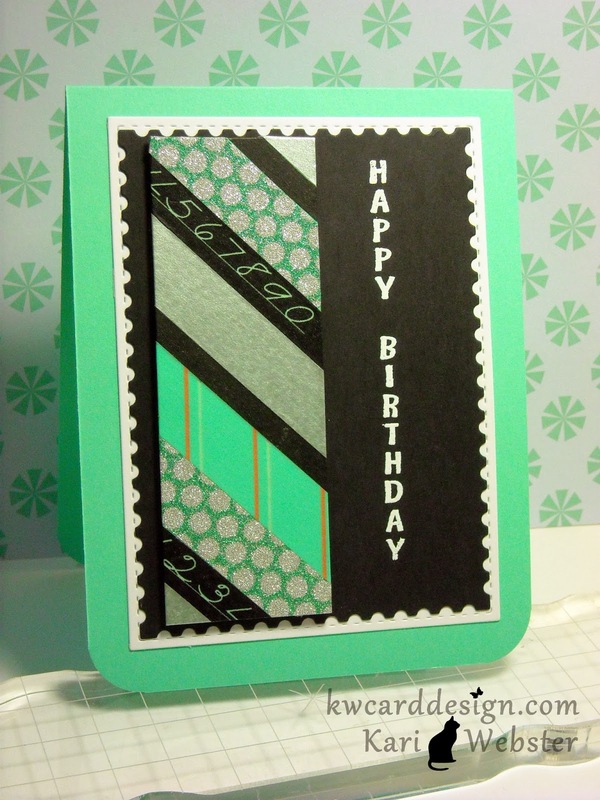 I used a new Paper Smooches stamp set called Just a Note. I also used various colors of Hero Arts Shadow Inks in Ultra Pink, Lemon Yellow, Dark Quartz, Mint Julip, and Corn Flower. 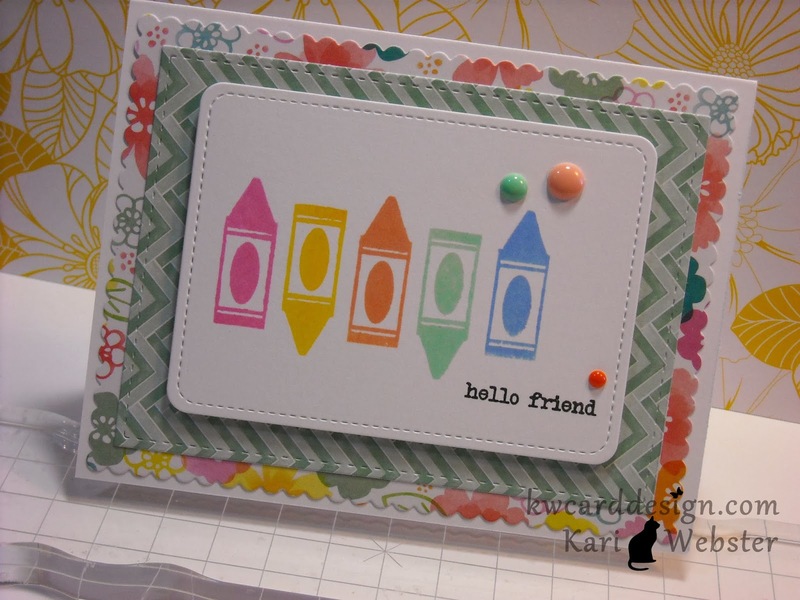 I stamped the crayons onto a piece of Bazzill Marshmallow white card stock that I ran through my Big Shot using the Lawn Fawn Stitched Journaling Card Die. 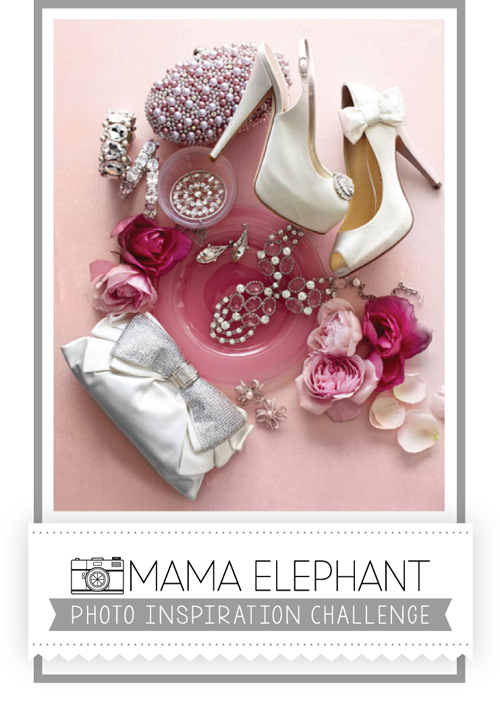 I also used dies from Mama Elephant's Femme Frames. I used patterned papers from Amy Tangerine's Yes, Please 6x6 paper pad. I'll be picking a *winner* Monday! Hello! I just wanted to pop in and remind everyone of my giveaway, and the comments will be closing on Sunday! So if you'd like to enter for your chance to win, be sure to get your comments in! Also please spread the word....there's free Pretty Pink Posh pretties to be won! Here's a direct link to my BLOG POST about it! I just wanted to share with you that I'm over at the Lawnscaping Blog today!! Here's a sneak peak at my project!! Go check it out!! Hi everyone! I'm posting on the blog today my entry for the Mama Elephant Challenge! YEP! That's right Mama Elephant is doing challenges now! So exciting. I really do love their stamps and dies! They are quickly becoming a favorite company of mine! This was a great time for me to use some of these stamps that I haven't inked up yet!! I used the set Lights Out, and I also used the oh so loved by me Femme Frames! 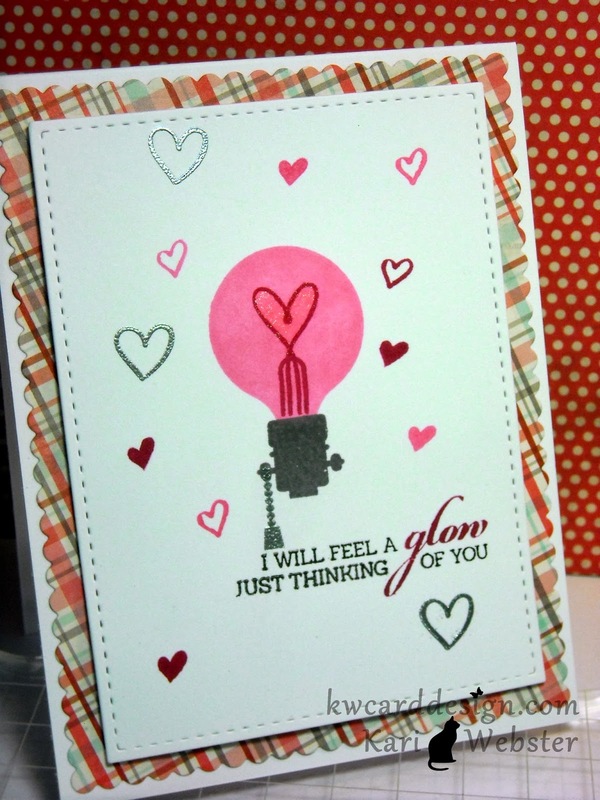 I stamped one of these adorable light bulbs in Bubble Gum Ink from HA, and then used the inside of the bulb using the heart image stamped in Raspberry Jam ink also from HA. I stamped the bottom part of the bulb in Espresso Truffle Memento ink, and then stamped the little chain in VersaMark ink and heat embossed it in Silver embossing powder. It is a little tough to decipher that here. 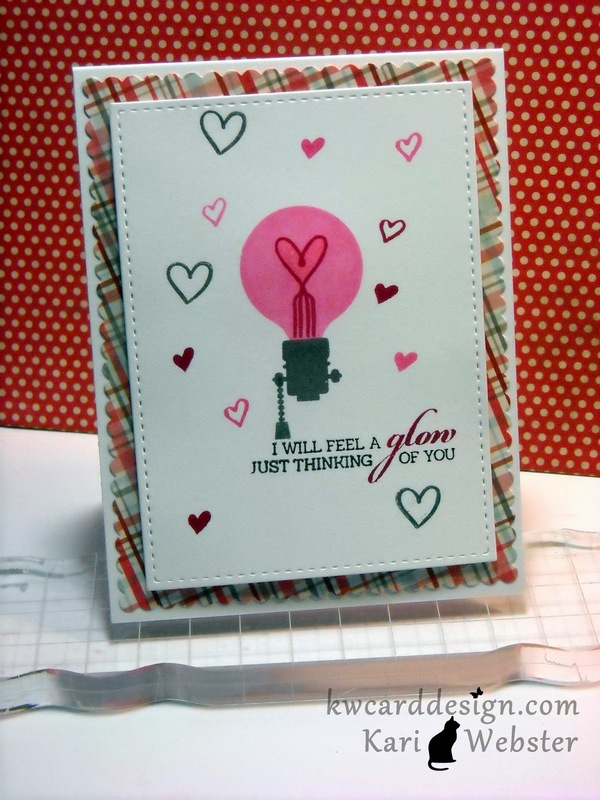 I chose the sentiment " I will feel a glow just thinking of you" and carefully inked it up in Raspberry Jam and then in the rest in Versa Fine Black ink by masking it off in parts. Then, I randomly stamped some hearts found in the new Pandamonium set in the same inks, and also heat embossed in silver the larger hearts. My pattern paper background panel is an older MME 6x6 pad called "Love ME". To finish the card off, I HAD to use some Wink of Stella *wink* to my heart in my light bulb to give it that shimmery glow. So fun! I plan on doing these challenges again....because Mama Elephants stamps are fun!! Hi everyone!! I wanted to start off the new year ( 10 days in) with doing a GIVEAWAY! If you are familiar and love PRETTY PINK POSH sequins - than this giveaway you'll be interested in! Pictured above is the prize pack I am giving away. To give you a little back story on how this giveaway came about is - When Paulina opened up her shop - she had a blog hop for the occasion and I was one of her winners during that blog hop - well to make a LONG story short - she sent me out my prize pack and I never received it after a few weeks - and I contacted her again, and she was sweet enough to send out another prize pack - and she said I could do a giveaway if I ever received the first prize pack! SO - here I am passing on the sequin goodness to YOU!! To ENTER and to be eligible: You will need to be subscribed to my blog or my Facebook Page which is HERE ( I will check!) and you will need to leave me a comment either here on THIS post on my blog or my FB Page ! Comments will close on Jan. 19th - and I will choose a winner Monday January 20th via random. org. I welcome INTERNATIONAL subscribers as well! Thanks to Paulina for letting me do this giveaway! 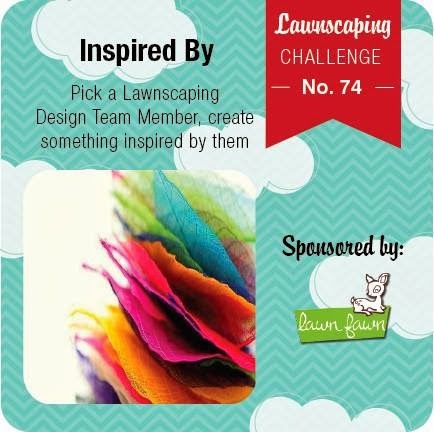 Welcome to the first Lawnscaping Challenge of 2014!! We are kicking the year off with a PARTY! We are celebrating Lawnscaping's 4th year!!! YAY! We are also excited that Simon Says Stamp will be a sponsor again in 2014! 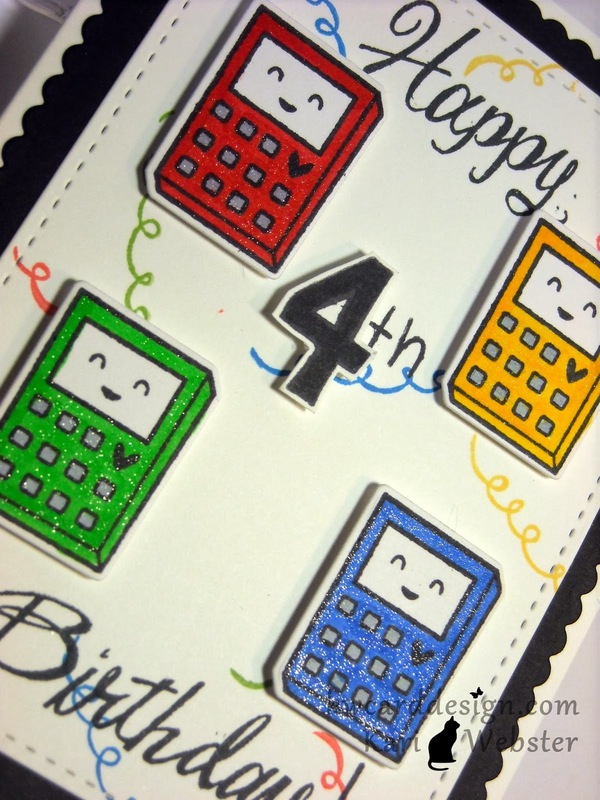 I wanted to make a card featuring that it is Lawnscaping's 4th year!! I was *really* wanting to use Lawn Fawn's newest set Science of Love and its coordinating dies somehow in this card!! So - I thought it would be cute to use the calculator! 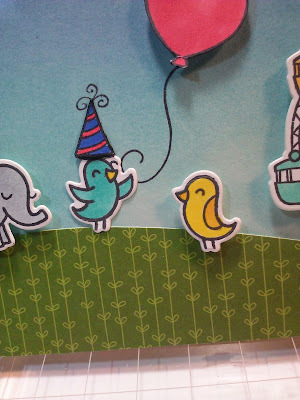 I stamped and die cut it 4 times and I colored it with some Copics in some primary colors. I used the 'Happy Birthday' greeting from Grand Greetings, and I used also Quinn's 123's and Jessie's ABC's. For a little bit more of a festive birthday look I added some streamers from Bake Me A Cake and stamped them using some Memento dew drops in the same primary colors. 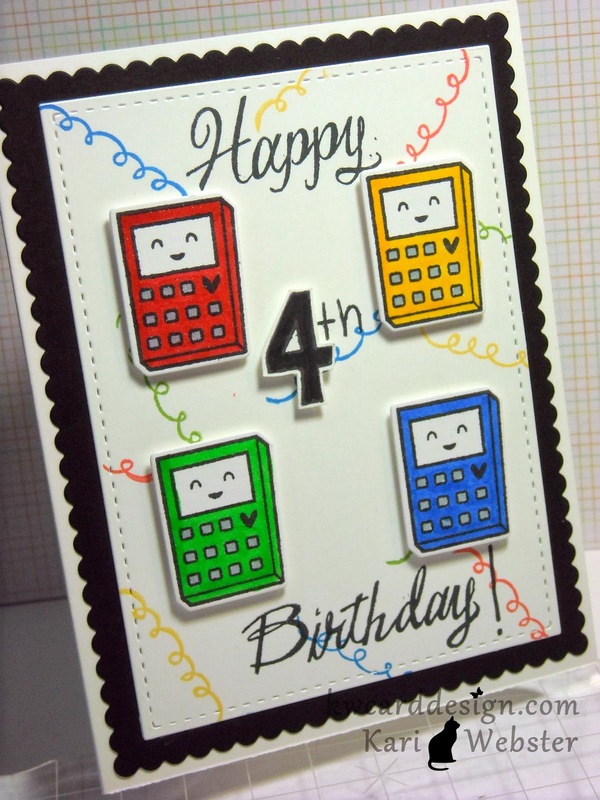 To finish off my card - I added some Wink of Stella to the calculators. Hope you are able to join us for this happy challenge, and submit your birthday/party themed card!! See you over at the gallery!